IAM Local 778 Steward Jason Capra, middle, won a John Deere tractor in the 2016 IAM Grand Lodge Convention raffle. From left, Local 778 Secretary-Treasurer Cory Wallace, Local 778 Directing Business Representative Joe Capra, Jason Capra, John Deere salesman Jeff VanSlyke and Heritage Tractor Vice President Dale VanSlyke. Kansas City, MO Local 778 member Jason Capra recently won the 2016 IAM Grand Lodge Convention raffle for a John Deere Gator voucher worth $14,999. Capra, a nine-year IAM member and Steward at Belger Cartage Service, did not believe he had won when he received the phone call from IAM Midwest Territory General Vice President Philip J. Gruber. “I’m hoping to make your day better,” said Gruber when he told Capra he had won the voucher. “Is somebody messing with me?” asked Capra. “You can believe it and you are the winner,” replied Gruber. 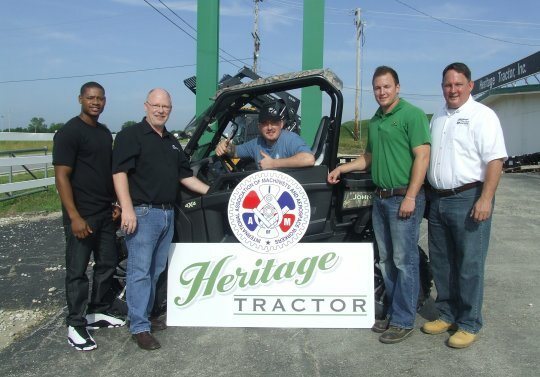 Capra promptly ordered a new IAM-built John Deere Gator RSX850i from Heritage Tractor in Harrisonville, MO. He intends on using it for hunting, fishing and recreation.